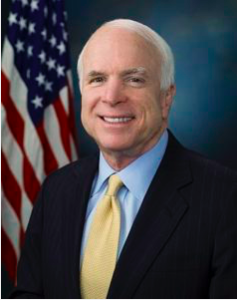 Arizona’s senior senator, John McCain, died Saturday afternoon, 9 years to the day after Sen. Ted Kennedy — of the same kind of cancer. “History does rhyme,” Preet Bharara, the former U.S. attorney from the Southern District of New York, said in a tweet. I’m sure that Ted was waiting to greet his friend on the other side. McCain will not be buried near the family patriarchs at ‎Arlington National Cemetery in Virginia. Instead, he will return to his youthful stomping grounds, the U.S. Naval Academy in Annapolis, Maryland, to be buried at the cemetery there. That ceremony was expected to be private. McCain will be buried near his old Navy pal, Charles “Chuck” Larson, also a member of the academy’s Class of 1958. Senator Chuck Schumer of New York, the top Senate Democrat, said on Saturday that he would introduce a resolution to rename the Russell Senate Office Building — currently named for Senator Richard Russell of Georgia, who often opposed civil rights legislation — in honor of Mr. McCain. Mr. McCain would be the 13th former senator to be granted the honor of lying in state in the Capitol Rotunda, according to the Architect of the Capitol. Mark Salter, who served as a staff aide and speechwriter for Sen. John McCain and also collaborated on books with McCain, writes at the Washington Post, John McCain spent his life serving the dignity of his fellow man. Arizona’s junior Senator Jeff Flake, also writes at the Washington Post, I am grateful for John McCain. The New York Times editorializes, John McCain, a Scarred but Happy Warrior. The Washington Post editorializes, John McCain, the irreplaceable American. The Arizona Republic editorializes, John McCain never quit on us. Not on Arizona, the U.S. Senate, America or the world. The Arizona Daily Star editorializes, Star Opinion: Remembering Sen. John McCain. There will be many more tributes to Senator McCain over the course of this week at memorial services in Arizona and Washington, D.C.